The newest trend in Greek life at many universities is suspending fraternities and sororities, either one by one or as a whole. West Virginia University, a medium-size public university in Morgantown, has opted for the latter, suspending every frat and sorority on campus after an 18-year-old was found unconscious and not breathing at the Kappa Sigma house, an event university officials referred to as a "catastrophic medical emergency." The move comes just a week after a different frat got involved in a full-scale street fight. 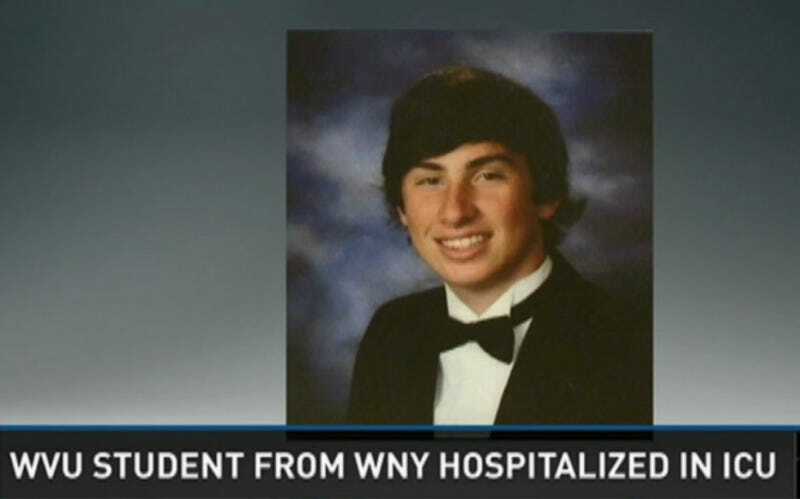 NBC has identified the 18-year-old as Nolan Michael Burch of Buffalo, New York, and spoke to hospital officials who say he remains in critical condition. Police were called to the Kappa Sigma house a little before noon on Wednesday and found him unresponsive. That's just eight days after another 19 pledges of another frat, Sigma Chi, were arrested and charged with underage possession of alcohol during the aforementioned street brawl. According to NBC, "The students initially identified themselves as being members of a rival fraternity and could face charges of obstruction of justice for providing fictitious information, Morgantown police said." Earlier this week, Johns Hopkins University temporarily suspended Greek parties after a 16-year-old was raped in a bathroom at a frat house. In late October, Cal State Northridge suspended all Greek pledging activities, following the death of a 19-year-old pledge in July during a hazing ritual that involved a brutal force hike. That particular frat, Pi Kappa Phi, was shut down, but campus officials suspended pledging altogether after another pledge reported yet more potentially dangerous hazing at the beginning of the school year. MIT and Emory University have also suspended some Greek activities. It's the start of a larger debate, one this Inside Higher Ed article lays out pretty clearly: will mass bans on fraternities or sororities will serve as a successful deterrent, or merely push parties off campus? A better question: why would universities — both legally and from a practical standpoint — want to continue sponsoring organizations where binge drinking, sexual assault and fatal or near-fatal misadventures of all kinds continue to happen on a regular basis? What exactly are colleges or students getting out of Greek life? And is it worth this high a price? Update, 1:00 p.m.: NBC is reporting that Burch has died.